October 4, 2018 October 4, 2018 - by Deric - 3 Comments. Liverpool slumped to a 1-0 loss at Napoli on Wednesday thanks to a 90th minute winner from Lorenzo Insigne, a result that sees them drop to second in Champions League Group C, level on points with Paris Saint-Germain. Mohamed Salah‘s quiet game for the Reds was a key reason they came up short, as the winger was well-marshalled by Napoli’s defenders and barely had an impact on the game. Here’s a closer look at his performance. Salah took up his familiar berth on the right wing but never got going on Wednesday, delivering a subdued performance in which he was the most ineffective player on the pitch. It was not for a lack of trying, but this was a night where nothing came off for the Egyptian as the Napoli defenders had the measure of him. He put in a fair amount of effort defensively, but couldn’t contribute in the way Liverpool needed him most. When a player is having a poor game, the most anyone can ask for is that he continues to put in the effort. 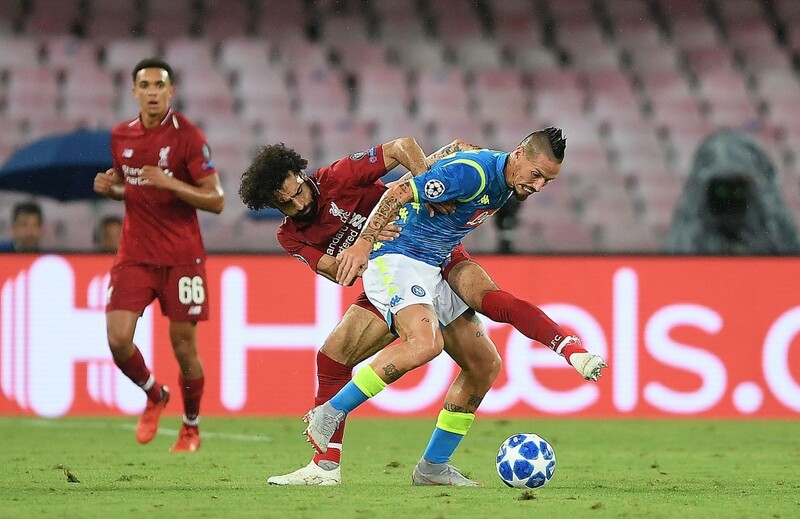 Salah’s work rate was commendable, as he remained a diligent part of the Liverpool press, and chased down whichever Napoli player had the ball in his area. He didn’t track back much – Salah staying high up the pitch is part of what makes the Liverpool counter so dangerous – but in all other aspects, this was a hard-working performance. Salah was barely involved, in an attacking sense. His 36 touches were the fewest touches of any player who started the game, barring his team-mate Naby Keita who went off injured in the 19th minute. Even Napoli keeper David Ospina had more touches of the ball. The 26-year-old was also ineffective when he did get on the ball. He misplaced nearly 30 per cent of his passes, and was dispossessed three times – stats that show just how off-colour Salah was on the night. Salah had a decent game defensively. Salah’s latest return to Italy was much less triumphant than his previous one, when Liverpool edged past his former club Roma in last season’s Champions League semi-final. In truth, through ten appearances this season the star forward hasn’t reached last season’s heights, thrilling only sporadically. This was a performance where he didn’t thrill at all, as he struggled to make an impact, or get going at all. This was among his worst displays in a Liverpool shirt. develop over time. I really like it whenever people come together and share ideas. such as you wrote the e-book in it or something. I think that you simply can do with some p.c. to power the message home a little bit, however other than that, that is wonderful blog.